This is an old traditional recipe of stufffed poori from eastern Uttar Pradesh called as daal bhari poori, made for festivals and on arrival of a new daughter in law in the family as that is seen as the arrival of laxmi too (this is my guess as I am terrible regarding wedding traditions and rituals). Daal ki poori or puri is unlike any other poori as it is bigger and fatter than other pooris, softer when it comes on your plate and feels like a stuffed paratha but not quite a paratha. One thing is for sure that this poori is considered auspicious and I remember this being made on the day of Anant chturdashi, Dussera and Raksha Bandhan, probably a few more religious rituals. The version of daal bhari poori made in my parental home was a bit dry, the stuffing used to scatter on the plate and one always needed some patience with it. I made a few changes in the process of making the pooran (filling) while keeping the ingredients same, the result was better than I expected and this procedure became a permanent fix in my recipe of daal bhari poori. My mom used to boil the chana dal and discard the water ( to be used in a yummy soup), grind the chana dal with tempering and then filling the almost powdery crumbly dal to the pooris. 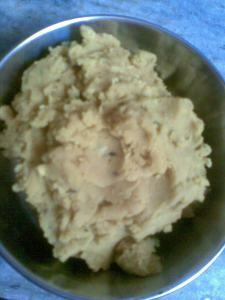 I did not throw the water and blended it with dal with the help of a stick hand blender, tempered it and cooked for a while to make it dough like. Read on to know how this pooran or stuffing is made. 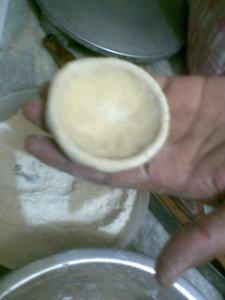 A normal chapati dough is used to make this poori and you have to take care of the consistency of the dough. 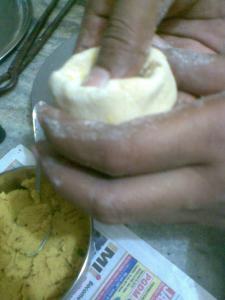 It is a tip I learned from my grandmother that if you keep the consistency of the dough and the filling same , it will be easier to stuff, roll and lift the stuffed poori from the chakla (rolling board), the stuffing will be distributed equally throughout the poori and it will not get ruptured in frying oil. This precious tip helps me always. 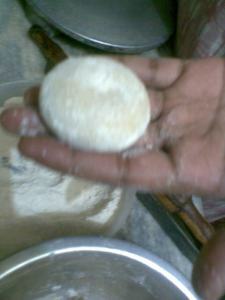 So make a dough which is of the same consistency as the filling you made, and use freshly made dough for good results. I hope all the pictures showing the stuffing process will be useful as many people find it very tough. 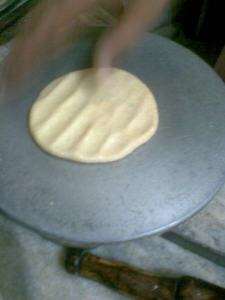 The poori gets ruptured while frying and can't be used after that. Shallow frying using a tawa is the only option left then, but the texture becomes very different. 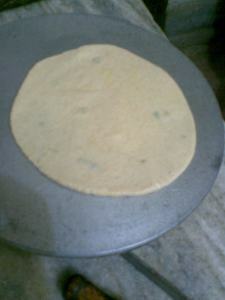 The pictures below show how the stuffed poori is flattened first and then rolled. 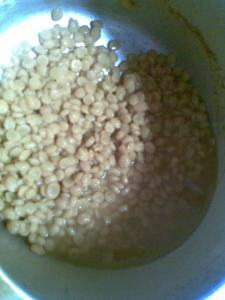 Fry in hot oil to get puffed up, making fluffy soft daal pooris. We enjoyed them with low oil green papaya masala stew as I did not have pumpkin that day which is the traditional pairing with this poori. The poori tastes very good the next day too, so make it in good quantity as you may want the basi poori too. It is a keeper recipe from simple ingredients and great flavors, just like all traditional recipes. 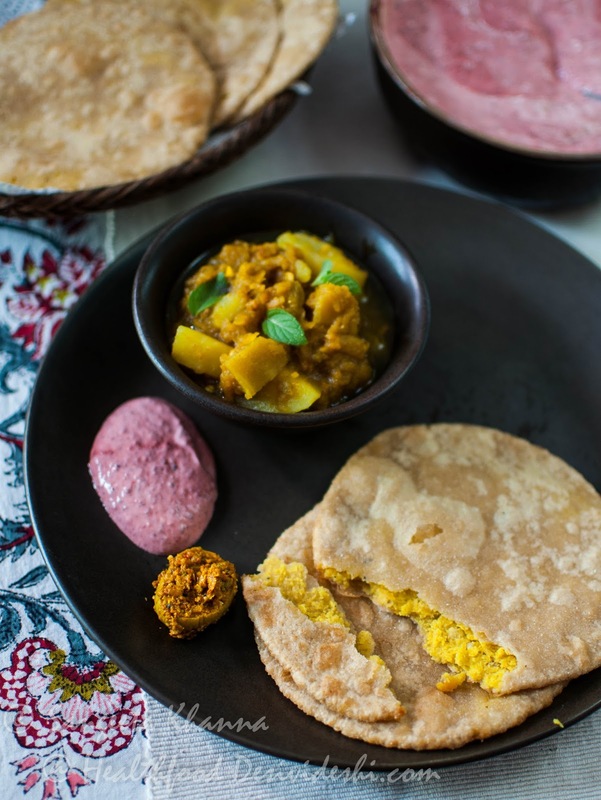 Puran pori or puran poli is a sweet version of a chickpea stuffed poori, a maharashtrian-gujarati recipe. This dal bhari poori seems to be a cousin of puran poli. 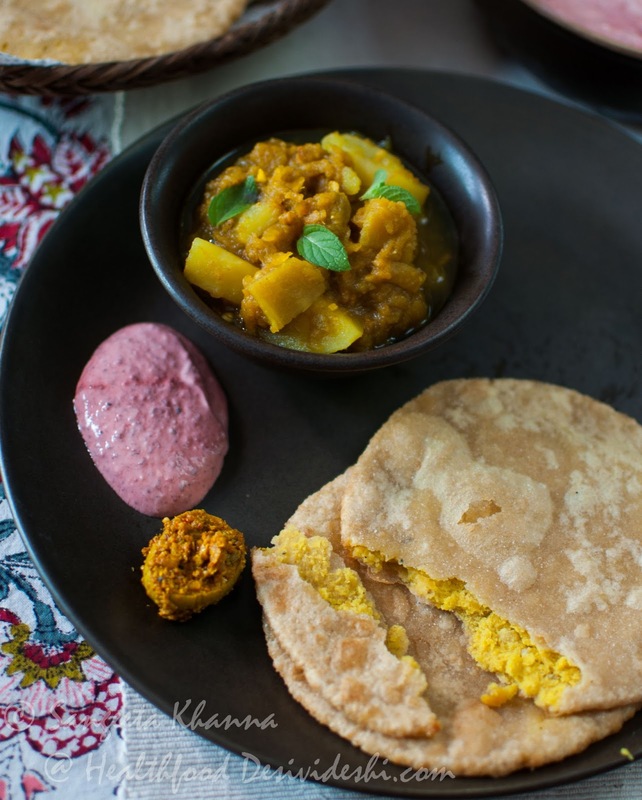 Here we had it with beetroot raita, raw papaya stew and ambde ka achar. It is a very healthy and appropriate side dish with any kind of poori (or chapati) as it is very low on fat and makes the meal balanced regarding calorie and fat consumption. All you have to do is, heat oil in a pressure cooker pan and throw in all the spices and ginger garlic and green chillies together into it, followed by turmeric powder after a few seconds and then the papaya cubes and salt. Add 2 tbsp of water so that steam can be formed and pressure cook till one whistle. Cool to release pressure and serve hot with or without garnish of mint or coriander leaves. The same stew can be made with pumpkin too, just replace green papaya with pumpkin. Again simple ingredients resulting into a yummy healthy stew. Remember this daal bhari poori tastes great the next day too so make some extra. Lovely spread of daal puri..the use of green papaya in curry is new to me. What a coincidence????? My god! Both of us happened to post the same prep.... Too cool ha!! Oops sorry! I missed the stew beside the poori.... All that I was engrossed in was the stuffed poori.... So don mind Ha! Ok that does it, we are all moving in with you now! @ Deesha..thankyou and welcome here..
@ Ash i saw your pooris n they look just perfect. ya this meal is traditional during dusshera looks yum,..
Sangeetha,regarding ur query even I googled about Foogath.According to my knowledge Foogath can be any sort of vegetable curry as long as it has coconut,curry leaves and tempered with simple tadka. Nice step by step pics... the combo looks too good! I am a recent follower of your blog..u have a nice space and post very authentic recipes...I too belong to the region so can relate with most of the recipes .. I had missed this one. 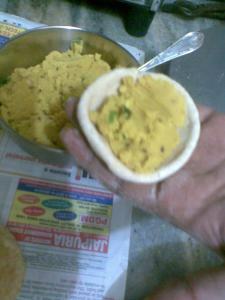 Very nice Dal puri. In bengali style, garlic is not used. I normally buy Dal puri from a near by Bemgali sweet shop. Ushnish ..i love the bengali version , radhaballobhi with alu dum.. In my village near to Varanasi, when bahu come first time to her in-law place that day Dal Puri(Dhuski) and Kheer is traditional recipe which she will get to eat first time. 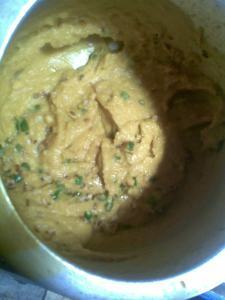 One query Sangeeta, do you use the same spices, method for the pumpkin curry as in the raw papaya curry given here. Want to try this over the weekend. This green papaya stew is made a different way and it does not taste like the pumpkin curry at all. 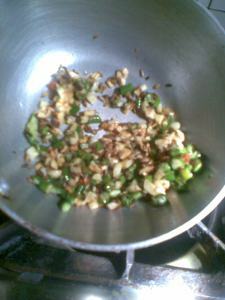 Heat mustard oil (pressure cooker is used) and throw in whole spices like whole red chillies (must) n black n green cardamoms , cloves , cinnamon,bay leaves peppercorns n cumin seeds .. let them splutter and then add a generous amount of garlic n ginger julienne followed by sliced onions and raw papaya cubes ...onions should be half the quantity of papaya ..add salt n turmeric powder ( no other powder masala ) a little water and pressure cook till the first whistle blows . Gently mash after opening the lid. Will try and post the detailed recipe very soon. Am wondering about the pumpkin curry that acompanies this dish! Have you posted that recipe before? The recipe of subzi featured here is the green papaya stew and not kaddu . See pumpkin or kaddu recipes in the blog archives , i have now added the labels.